Last night I checked twitter just after 5 pm as my writing day was drawing to a close. I happened to spot a tweet from @WaterstonesPicc that my creative hero, J.J. Abrams, was going to be signing his new book, S, at their flagship store in less than hour. 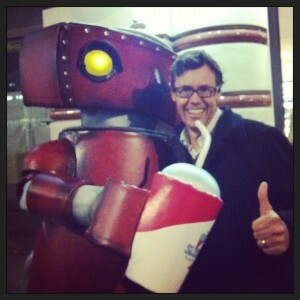 Sharing a soda with the (not so) Bad Robot. It’s a rare and special thing to meet the person who’s creativity inspires your own. To me, J.J.Abrams is a master storyteller; he’s developed and perfected an unique blend of suspense, mystery, and playfulness (if you haven’t seen his TED talk, it’s well worth 10 minutes of your life). I tried not to be too fan-boy about the whole thing; but it was hard to repress my excitement. 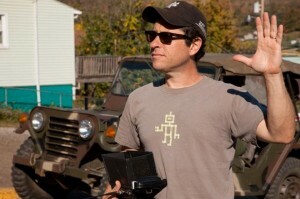 The ultimate multi hyphenate, J.J.Abrams on set. His Bad Robot production company and animation house Pixar are the two ultimate creative forces in the world of entertainment today. Coincidentally, I’d just written a piece in the Guardian about how I’ve been pinching the creative process from Pixar and Bad Robot (which you can read here). I told him I’d done the piece and he seemed genuinely chuffed (British for pleased), we chatted about my books, I thanked for doing the signing, and that was that. 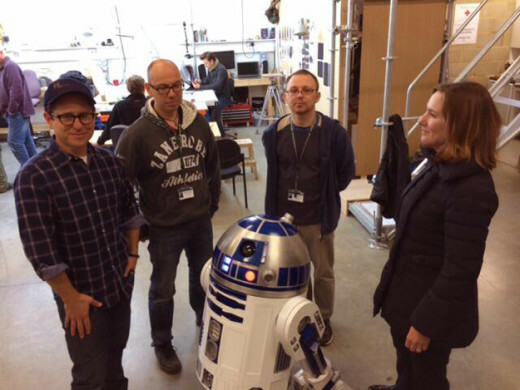 He met hundreds of people that night and the next day moved onto his “day job” directing Episode VII, but to meet the man who inspires my own work will stay with me through my working life. After meeting me, J.J. was inspired to cast this little droid in his next film. I’d love to hear from you – who’s your creative hero? How does he or she inspire you?